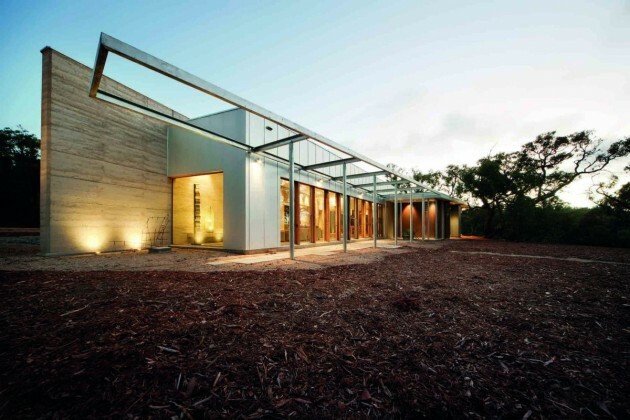 Morris Partnership have designed the Hinterland House in rural Australia. 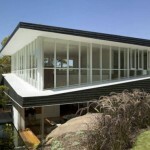 The house is situated on a graveled, previously cleared rise, overlooking a large dam in a high bushfire category zone. 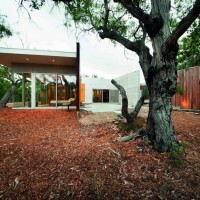 The house was required to be in harmony with the fragile, over grazed scrub and small stature eucalypt forest covering the 11 hectare site. 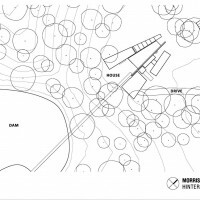 The philosophy was to create a building encapsulating the diverse environmental qualities of the site….. wide and seductive views to the dam, closer views to the modest scrub and grasslands, and intimate views to particular single eucalypts. The abundant wildlife was to be encouraged to roam the site with no screening, fencing or garden works. Existing internal fences were to be removed. 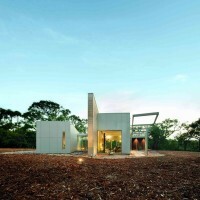 The building design reflects the illusive nature of the coastal hinterland. It does not dominate the landscape but instead encourages a variety of visual and sensual experiences. It encourages a connection with the earth. The design is a fragmented building with living, working and sleeping zones separated by glazed slots, links and open spaces. This enables views and qualities of the site to be both enjoyed and confronted. Movement between zones provides a continual disconnection reinforced by changes in materials. 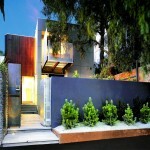 The house requires a journey, with minimal definition between the interior and exterior materials and spaces. The entry track winds simply through the hinterland scrub to the house. 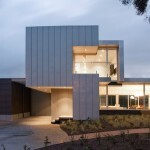 Upon arrival, the overall form of the house is deliberately illusive – challenging any predetermined expectations. A powerful rammed earth wall, firmly anchored to the ground, enables other elements to float. The site seems to flow through. Entry is simple and low key. 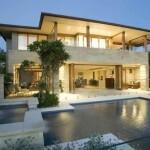 Once inside the house and moving through the various zones, the excitement of the building and the site is revealed. Personal privacy is created without the use of barriers. Few window furnishings are required. 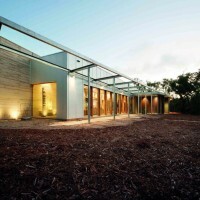 The rammed earth wall and the materials palette of spotted gum, rough recycled timber, concrete floors, corten steel and zincalume are used both internally and externally. 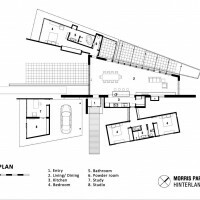 These materials tend to be concentrated in various zones highlighting the disconnection and fragmentation of the architecture. Functions and the location of certain elements also encourage occupants to sometimes turn away from the outdoors and concentrate on more personal spaces. Building environmental issues are addressed through carefully considered design elements including building mass, double glazing, shading and cross ventilation that mitigates against the need for air conditioning. Sustainability solutions include the use of worm farm waste treatment, solar heating and hot water, and the cellar pantry drawing cooled air through an underground chamber. 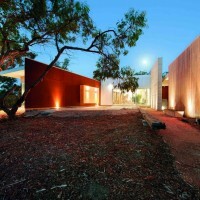 This house is provocative in its rejection of any easy gratification of the aesthetic – it beckons the occupants to think, observe and encounter the uniqueness of the Australian bush.